In October 2018, the UN’s Intergovernmental Panel on Climate Change (IPCC) warned that carbon emissions must be cut to zero by 2050, in order to limit the global average temperature rise to 1.5°C above preindustrial levels.1 The current British (non-binding) target for 2050 is an 80% cut. The world has already seen 1°C warming, and the IPCC says that the impacts of a further rise – including more extreme weather already being felt, increased droughts, the spread of diseases such as malaria, economic damage and harm to yields of maize, rice and wheat – will be much less severe if the overall figure is limited to 1.5°C than to 2°C. The IPCC calls for “fast and far-reaching” changes to power generation, industry, transport, buildings and potential shifts in lifestyle such as eating less meat. rapid economic transition requires proactive governance – markets cannot accomplish the task. The paper’s weakness however is that it comes down in favour of ‘Post-Keynesian’ solutions instead of changing the economic system. The book’s title has two meanings: firstly, that humanity in the 21st century faces a crisis in the Earth System, i.e., in the Earth as an integrated planetary system, encompassing interlinked physical, chemical and biological processes in the biosphere, geosphere and atmosphere (“life is a player, not a spectator”); and secondly, that survival in the Anthropocene requires radical social change, replacing “fossil capitalism” with an ecological civilisation, ecosocialism. 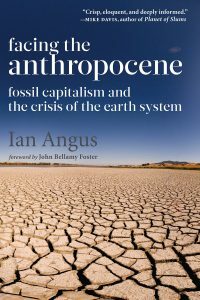 The first part of the book deals with the Anthropocene as a period without analogue in geological history. The term itself has been coined three times, first by Soviet geologist Alexei Pavlov in 1922, but most recently was reinvented in February 2000, at a meeting of the International Geosphere-Biosphere Programme (IGBP), by Paul Crutzen, who gained the 1995 Nobel Prize in Chemistry for identifying the chemicals destroying the ozone layer. The idea of the term is that the Earth System as a whole is being qualitatively transformed by human action. The impact is enormous, and most of it is due to countries in the Organisation for Economic Cooperation and Development, accounting for 74% of global domestic product, but only 18% of the population. IGBP team member Will Steffen coined the term “The Great Acceleration” to describe the trends in both sets of graphs. sea level rises due to global warming, together with acidification of ocean water as a result of higher CO2 concentrations. The International Union of Geological Sciences asked the London Stratigraphic Commission to convene an international Anthropocene Working Group (AWG) to investigate. As of 2018, the AWG is still working;4 but Angus reports (p 55) that in 2015 two thirds of its members had signed up to a mid-twentieth century date for the start of the Anthropocene, evidenced by anthropogenic deposits containing new minerals and rock types, including elemental aluminium, concrete, plastics, black carbon, inorganic ash and nuclear fall-out. The current crisis however lies not only in the data in the figures, but in the many linkages and interactions which they fail to capture. Also, once certain thresholds or “tipping points” are passed, rapid nonlinear changes can ensue. A 2009 paper from the Stockholm Resilience Centre identified 9 linked planetary boundaries as “most important to maintaining the stability of the planet as we know it” (p 71ff). Two of these (biosphere integrity and interference with the nitrogen and phosphorus cycles) are already in the high-risk zone, while two others (climate change and land-use change) are in the danger zone. Land-use changes can influence climate, and crossing the nitrogen/phosphorus boundary can reduce the ability of marine organisms to absorb CO2. There has already been one near catastrophe in recent years – the above-mentioned hole in the ozone layer, caused by the release into the atmosphere of chlorofluorocarbons (CFCs), used as refrigerants from the 1930s. The ban on CFC production – opposed by corporate interests – came in the nick of time, though not without 10,000-20,000 early deaths due to increased ultra-violet radiation. It will take nearly the whole of the 21st century before the ozone hole is completely repaired. 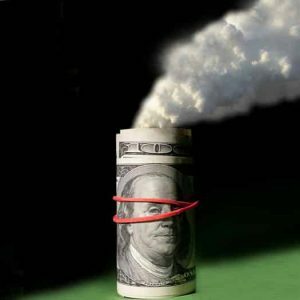 Dealing with CO2 emissions and their impacts will take a lot longer. Much of what is being released today will still be affecting the climate in 1000 years’ time. If business as usual continues, global average temperatures could be 4°C above preindustrial levels by 2080 – meaning 6°C or more on land and 16°C in the Arctic. The tropics and equatorial regions will go from hot to extremely hot. And the transition is already well under way: the climate pattern is skewing to heat extremes. Not only will living systems be stressed by a new temperature envelope “hotter than the hottest systems to which these systems are currently accustomed” (p 100), but there will be lost labour capacity, or else premature deaths, due to increased risk of working out of doors under conditions where the human body is unable to control its internal temperature. Part 2 of the book is focused on understanding the Anthropocene as a socio-ecological phenomenon – a qualitative change in the relationship between human society and the rest of the natural world. The shifts in the Great Acceleration graphs were the culmination of two centuries of capitalist development. 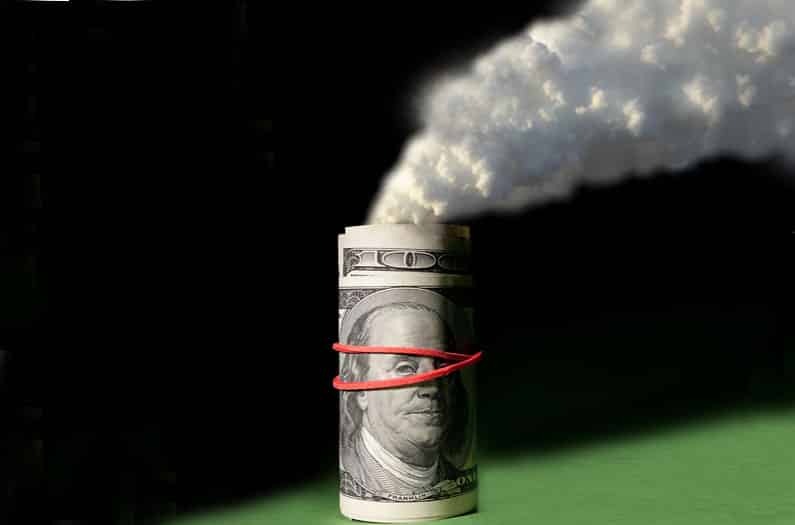 Why, in the face of scientific evidence about the devastating effects of constant economic expansion on the global environment, do corporate executives, pundits, bureaucrats and politicians all agree that growth is good and non-growth bad? Simply because growth is essential to capitalism, whose only measure of success is accumulation. But capitalism’s ecologically destructive impacts result not just from its need to grow, but to grow faster. In the 18th and 19th centuries, that need drove an epochal shift to a fossil-fuel based economy. However, the rift in the Earth’s carbon metabolism widened only slowly for a century, then reached a tipping point in the years following World War 2. Why did that happen? Global imperialist conflicts have been significant. Citing Andreas Malm’s Fossil Capital,5 Angus shows how the first Industrial Revolution developed on the basis of coal and steam for production and transport. This not only transformed societies in Europe and North America, but led to the expansion of empires and the development of military-industrial complexes. Widespread petroleum use only became possible around the end of the 19th century, with the internal combustion engine and the aeroplane; but the big military breakthrough was Winston Churchill’s decision in 1912 to convert Britain’s battleships from coal to oil. This expansion also resulted in a high degree of concentration: in 1930, 106 of the 200 largest US industrial corporations were in chemicals, petroleum, metals, rubber or transportation. They were thus well placed to take advantage of military contracts when World War 2 broke out. By its end, US corporations had made $52 bn in after-tax profits, accumulated some $85 bn in capital reserves, and added more than 50% to their productive capacity. (p 139) Plastics had grown to be the third-largest manufacturing industry in the US. Thereafter, the US ruling class embarked on “military Keynesianism”, with two objectives: to begin preparations for World War 3, and to prevent the social unrest that would occur if massive unemployment returned. This has been a fundamental feature of the US economy ever since. In the immediate postwar period, antiunion laws, the red scare campaign and strike-breaking through the use of wartime legislation led to a weakened and ideologically loyal labour movement, “which bargained for concessions without challenging basic dispositions of a business-led society”. (p 145) Meanwhile the Marshall Plan was used to strengthen US corporations – especially oil companies – since most of the money had to be used for purchases from such businesses. Oil accounted for 10% of all Marshall Plan spending; but because Congress had specified that US oil should not be used, the effect was to subsidise expansion of US oil companies’ then new facility in Saudi Arabia, as well as to reshape Europe’s energy use patterns away from coal. At the beginning of 1950, four key drivers of the long boom were in place: a powerful industrial base in the USA, concentrated in a few hundred giant corporations and dominated by the petroleum/automotive sector; a large and growing military budget; a disciplined and financially secure labour force, purged of militants; and a seemingly infinite supply of cheap energy – the price of a barrel of Saudi oil averaged less than $2 between 1950 and 1973. This was the basis for the Great Acceleration. The period up to 1973, often called the “Golden Age of capitalism”, belonged, as Eric Hobsbawm said, essentially to the developed capitalist countries (p 154), and even then not to all workers. But the emergence of a large, relatively privileged segment of the working class played a big role in keeping the long boom going. This was expressed in mass car ownership, housing construction in the suburbs, a boom in road-building (also necessary for moving troops and military equipment), industrial agriculture (not only mechanisation but synthetic fertilisers and pesticides, so that it now takes more energy to produce food than we get from eating it), military pollution (increasing total US emissions by 5% (p161)) and globalised production. Today, globally, there is more capital invested in oil and gas than in any other industry – as of 2010, $3,135 trillion, but double that if state-owned companies are included (p 170). But as well as yielding mega-profits, fossil fuels also provide food, clothing, homes, heat, transportation, communications, entertainment and much more. So can capitalism defossilise? Technologically, a big shift to renewable energy is feasible, but, says Angus, the energy status quo is essential for the profit system today, and that will always take precedence. Fossil fuels are not an overlay that can be peeled away from capitalism, leaving the system intact. They are embedded in every part of the system. Yet we are not all in this together. Climate change will have “dramatically unequal impacts across regions and social classes, inflicting the greatest damage upon poor countries with the fewest resources for meaningful adaptation.” (p 185) Climate refugees will be excluded by force, while the super-wealthy will always be able to create protected spaces for themselves. Indeed, in plundering the world, capitalism has made an increasingly large proportion of the population absolutely surplus to capital’s profit-making requirements (p 187). If this continues, the A Anthropocene will be a new dark age of barbarous rule by a few and barbaric suffering for most. There is much to commend in Angus’s book, over which I have only given a brief overview. I have a small number of disagreements, however. First, in correctly criticising the way in which socialism in the Soviet Union and eastern Europe replicated the quantitative development model of capitalism (p 210), Angus ignores the capitalist encirclement which forced the Soviet Union to industrialise, which in turn enabled it to rescue itself and the world from Nazi fascism. Secondly, in my view he underestimates the need, particularly in developing countries, for a rapid rise in the standard of living and so for a supplementary nonrenewable energy source in the phasing out of fossil fuels. Third, I disagree with him and Magdoff that the future ecological civilisation should ultimately stop growing, since humanity will always need progress – albeit that progress must be achieved in harmony with the environment. But fourth, and most seriously, I feel that Angus gives too little weight to the organised working class as the promoter of an “ecosocialist” future , and to struggles around immediate objectives which could curb the power of the fossil fuel lobby. Yes, workers in the power, oil and transportation industries see the need to protect their own jobs, just as do workers in the ‘defence’ industry. But without the organised working class at the head of the movement for progressive change, there is no way to challenge the power of finance capital and corporate interests. Workers need to be won for a Just Transition, which involves protecting their jobs and skills while we move to an (eco)socialist future. IPCC, Global Warming of 1.5°C, online at https://www.ipcc.ch/sr15/. UN News, Ambition, transformation, active citizenship: COP24 looks to next year’s big UN Climate Change Summit, https://news.un.org/en/story/2018/12/1027 501. Group of independent scientists, BIOS Research Unit, Helsinki, Finland, Invited background document on economic transformation to chapter: ‘Transformation: the economy’, http://bios.fi/biosgovernance_ of_economic_transition.pdf. A Malm, Fossil Capital: The rise of steam power and the roots of global warming, Verso, London, 1916. F Magdoff, Ecological Civilization, in Monthly Review, Vol 62, No 8, January 2011, pp 1-25.